What Is The Purpose Of A Weight Belt? We’ve all probably seen powerlifters on TV, on YouTube or even in the gym wearing a belt. Sometimes doing completely inappropriate in exercises whilst wearing one, like sit-ups, for example. Many people believe that weight belts are used to support the back and help to reduce the chance of injury. This is quite true, but a better understanding will change how many people use this kind of equipment. Actually, it’s clear that some gym belt manufacturers don’t understand how a belt should work, which is shown by some of the belts that they produce. Also, contrary to what many people think, the width of the belt at the rear actually has very little to do with the function of a belt. A large part of wearing a belt is about breathing. People are often taught during their gym inductions to exhale as the raise a weight and inhale when the lower it. And while breathing is necessary (of course), this method is not the best when a large amount of force is required or more specifically, when wearing a power lifting belt. Normally, when someone moves something heavy, such as a piece of furniture, they take a big breath, push or lift while holding their breathe and then only breath out when the movement is complete. This is known as the Valsalva Maneuver. Inhaling increases the pressure in the thoracic cavity and this pressure further increases when flexing the abs. And in short, this pressure keeps you from being crushed by a big weight when you squat. When performing squats, muscles in the back apply force and support the spine from the outside while the abdominal wall and extra pressure from a deep breath support it from the inside. 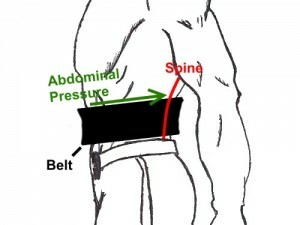 A belt’s main purpose here is to add support from the front by increasing intra-abdominal pressure (IAP). A good analogy for IAP is the box containing a balloon example. If you stack some weights on top of the box, at some point it will collapse. If you strengthen the box, you can probably stack a few more weights on and it will collapse. If you get an strong balloon and fill it up and put it in the box, it will support the box internally allowing it support even more weight. The balloon is what we would call our intra-abdominal pressure. So basically, a belt provides something for your abs to push against. This additional force with a limited amount of space means that an increased intra-abdominal pressure can be applied to the spine which will help to stabilise it. This will give you a more solid torso and better application of force form the hips to the bar. As well as this, it can provide a more stable overhead presses.